What is Santa Fe Arts Journal? Santa Fe Arts Journal is an independent online arts publication founded by freelance journalist and painter Emily Van Cleve, who has written about Santa Fe’s arts scene for local, regional and national publications for more than 20 years. Santa Fe Arts Journal launched on October 28, 2016. What is Santa Fe Arts Journal’s mission? 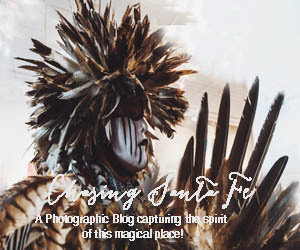 Santa Fe Arts Journal celebrates Santa Fe’s diverse arts community through engaging articles about creative individuals (visual artists, musicians, dancers, actors) and the events they present in town. 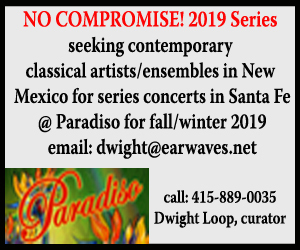 Santa Fe Arts Journal seeks out artists in all media who are creating exciting new work and revisiting traditions in contemporary ways. During its first 15 months, Santa Fe Arts Journal covered more than 400 performances and visual arts events through articles in its LOOK, LISTEN and LEARN MORE sections and postings in Emily’s column IN THE LIMELIGHT. How does Santa Fe Arts Journal reach out? Santa Fe Arts Journal has its own Facebook, Twitter, Instagram and LinkedIn accounts where it posts information about new articles on the site multiple times a week. Facebook activity is particularly vibrant. SFAJ reaches closes to 4,000 people a week on Facebook. Santa Fe Arts Journal also sends out a weekly e-newsletter to subscribers with additional information about arts events. In March 2018, Santa Fe Arts Journal launched its YouTube channel featuring short video blogs with “inside” arts information. Varying between three and four minutes in length, one vlog is uploaded weekly. Why advertise on Santa Fe Arts Journal? Santa Fe Arts Journal is read by arts enthusiasts living throughout New Mexico and around the world who want insightful information about arts events and not just calendar listings. Emily has been writing about the Santa Fe arts scene online since 2000, when she began a two-year writing contract with AOL. She understands the Santa Fe arts community and how to effectively communicate information online. *All ads are formatted to appear on mobile devices. Medium rectangle ads rotate positions, while large mobile banner ads stay in their fixed positions. * Santa Fe Arts Journal works with PayPal and accepts checks.